A lot of people are aware that currently, I am not working. In order to save time and stretch those food dollars as far as they can possibly go, I make a lot of home made soups and casseroles and simple meals involving chicken and lesser used meats, like turkey. 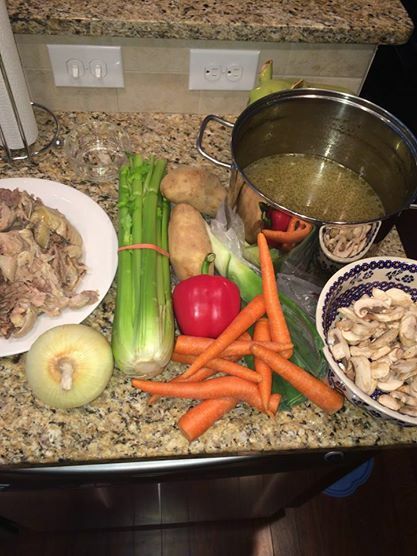 This is my (nearly) World Famous Chicken Soup that I make about twice a month. It freezes really REALLY well, so the stretchability (?!) is pretty far, usually 3-4 meals depending on appetite ( of husband) and size of the narrow-face ( chicken) involved in the recipe. I usually get my cooked chicken at BJ’s. A lot of people start with just a regular fryer, but I find that the rotisserie cooking imparts a delicious spice to the base of the soup. Bj’s always has these wonderful chickens cooking, all day. They are huge, juicy and at $3.99, a real bargain. For the two of us, Dear Hubby and I, it is a smorgasbord if numminess because there is enough to make a wonderful pot of soup AND some chicken salad for the hubby to take to work. He loves the stuff. The first thing I do when I get it home, is remove the skin from the chicken and throw that in a pot with 2 cups water, some salt, pepper, rosemary, oregano and 3 bay leaves. Then, with near-surgical precision, I take all the meat off the chicken and I divide it into 2/3 in one bowl, 1/3 in another bowl, wrap them up and put in the fridge until later. Take the leftover bones, gizzards ( if present) wing tips, et al, and throw them in the pot with the skin, salt and pepper. Add one cup diced Vidalia onion, 1/2 cup diced celery and 1/2 cup diced carrot and toss in the pot. 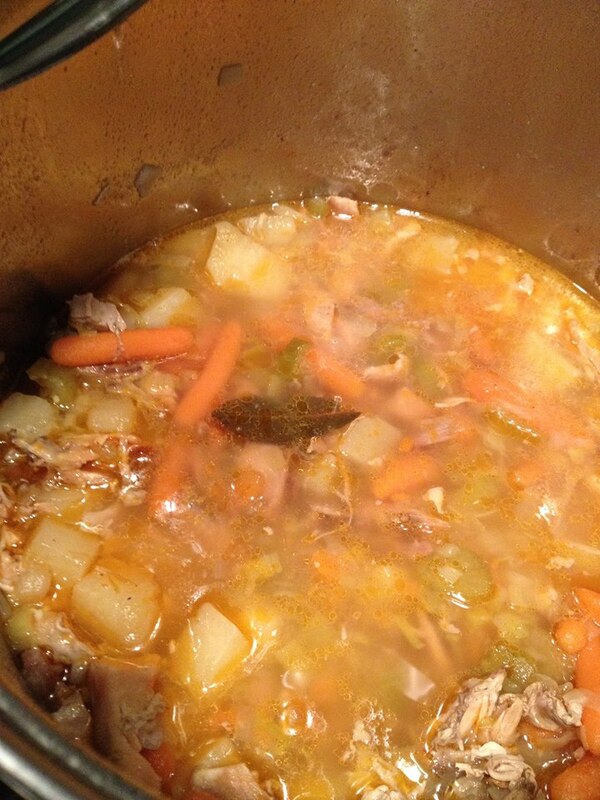 Turn the gas on medium and cover, and simmer about 4 hours, occasionally stirring and letting the stock reduce. Now is the really fun part, the gettin’ down to buziness part!